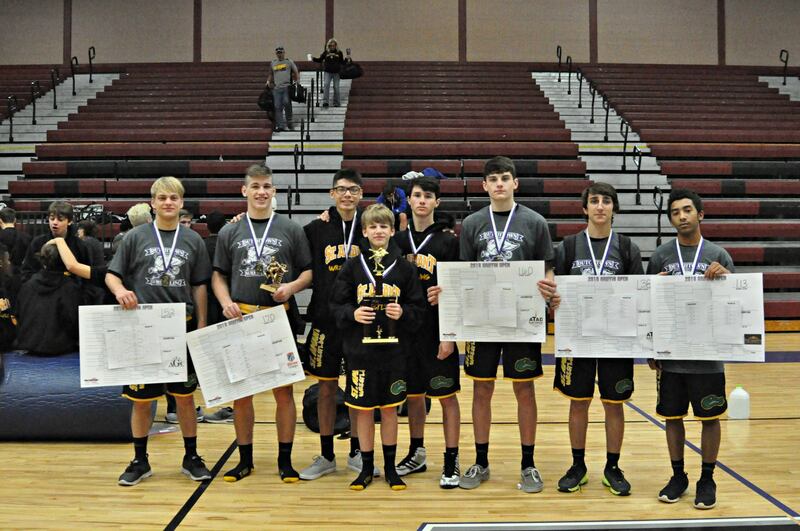 Louisiana's varsity wrestlers competed in four tournaments last Saturday in Dutchtown, Lafayette, Mandeville and Arlington, Texas. 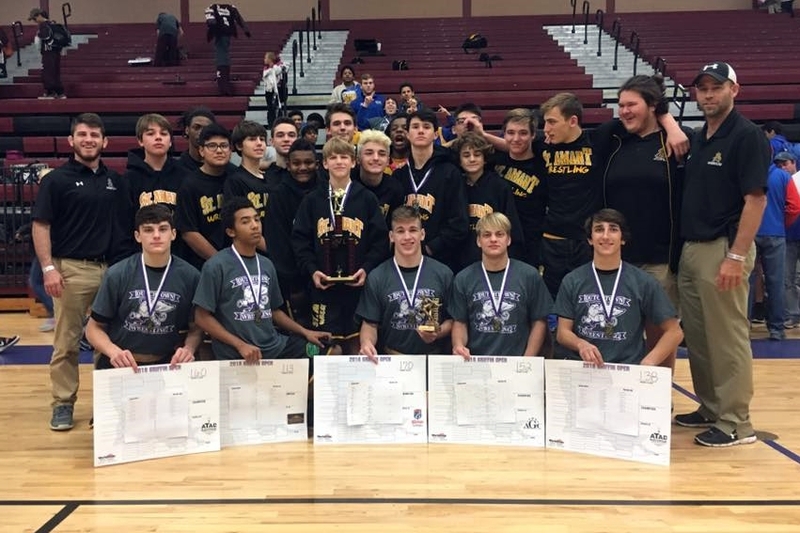 The St. Amant Gators won their second consecutive tournament title on Saturday, November 19th, at the Dutchtown Griffin Open. The Gators scored 162.5 points behind championships by Tyree Morris, Seth Signorelli (above - center photo), Cameron Hyde, Hunter Hawkins and Sage Nugent. Dutchtown, with a champion in Joshua Wright, placed second with 121 points and John Curtis placed third with 115 points behind champion John Bennett. Central's Austin Gouedy had four pins (three in the first period) and won the Outstanding Wrestler Award for the lighter weights. 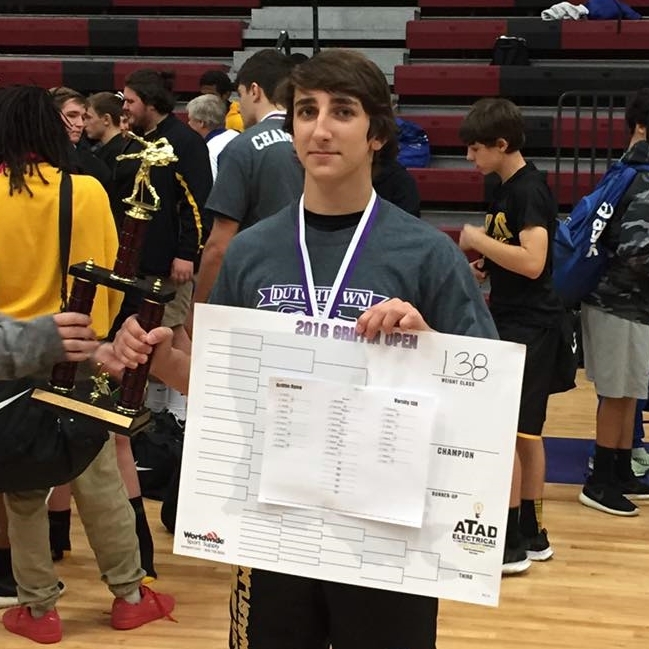 In the heavier weights St. Amant's Sage Nugent recorded four first period falls to win the Outstanding Wrestler award. Gouedy also won the Central Wildcat Open and the Warrior Invitational, making this his third title in as many weeks. East Ascension freshman Trent Mahoney notched his first varsity championship with a fall in 1:33 over Central's Tyler Fontenot. Having two champions, three runners-up and two third-place finishes, the Comeaux Spartans outscored host Teurlings Catholic 172 to 152 to win the Teurlings Classic Outdoor Invitational. Twenty-six one-hundredths of an inch of rain on Friday forced the tournament to move to the Lafayette High School gymnasium, although Saturday was precipitation free. The weather was almost an exact opposite of last year, when beautiful weather was expected until rain started falling around 4 a.m. Saturday morning. The Lafayette High School back-up plan did not work on that day, and hence the event was cancelled. In the lighter weights, Rayne's Cooper Simon was awarded the Outstanding Wrestler via two falls and a 10-3 finals win over returning Division III state champion Brenan Landry of Basil. Rummel's Josh Ramirez, who started with a 19-4 technical fall before semifinals and finals pins in under one minute each, was deemed the Outstanding Wrestler of the heavier weights. Having to put 12 wrestlers with no state experience in the state championships in February, Brother Martin is not lacking in candidates. A relatively fresh group won the Fontainebleau High School Bulldog Brawl last Saturday. The Crusaders scored 254.5 points, 23.5 more than host Fontainebleau's 231 points. Ouachita Christian, again looking like a formidable Division III threat, placed third with 164 points. The Crusaders' Justin Leal won his second consecutive event, having won the Jesuit Invitational on November 12th. * Van Horn defeated d'Aquin in 3:53 but lost to Frank Bretey of Hannan 11-6 and forfeited a match against Holy Cross' Jules Martin, causing his 2-2 record vs. d'Aquin's 3-1 record. 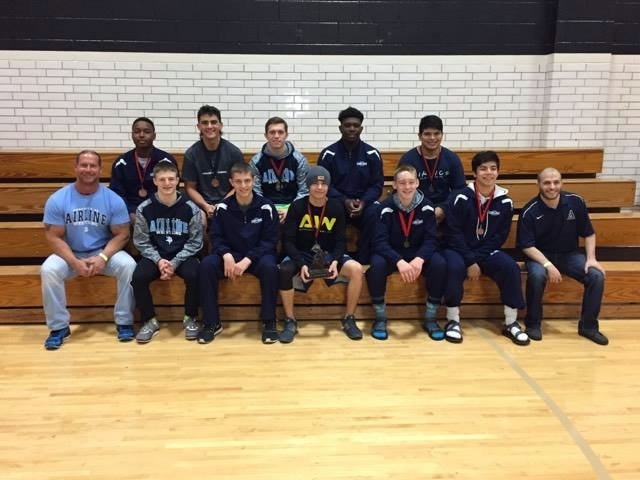 The Airline Vikings traveled to Martin High School in Arlington, Texas and placed third out of 32 teams in the Arlington-Martin Warrior Open. Seven Vikings placed 1st through 6th. Christian Walden remained undefeated by placing first. Dakota Brace was a runner-up, and D.J. Evans and Matt Salinas placed third. Joshua Partin placed fifth and Tucker Almond and Alex Davila placed 6th.